bitter sweet stamping: Henry's Creation! My 10 year old son, Henry, wanted to do some stamping last week, so he made a card for my mother, his "Gaga"! He has so much fun putting things together, and I have to say his color combo of Ruby Red and So Saffron turned out great! 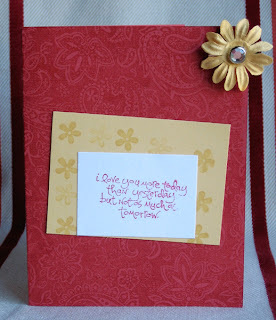 Stamps & CS by Stampin' Up! well done henry! this is a great card!